Nic Bogren got some great photos of PRSA frostbiting on the 15th. SSA sailed the first of their fall series on Saturday. Luke Shingledecker put up 2 bullets in two races to win. David Schoene followed in 2nd and Brady White was 3rd in the 19-boat fleet. Andrew Schoene led the 4-boat Radial fleet. Results and more photos by Spinsheet. We had a successful inaugural Corsica River Yacht Club Spring Regatta this past Sunday. The only thing that did not work out as planned was the wind. It was a beautiful, warm, sunny day but we had a steadily dying Easterly that after two races fighting the building thermal became too unstable to run a decent race. Unlike the annual regatta where we race in the Chester, we ran this event in the Corsica itself going back to the roots of the club in the 1930’s. The two races we were able to run were a nice 30 minute length windward/leeward course with the leeward mark in Middle Quarter Cove and the windward mark up near Ship Point giving us about a .75 NM windward leg. Easterly is a strange, and luckily uncommon, breeze on the Corsica. On Saturday night we also had the closest full moon to the earth of 2012 which created a decent current in the Corsica which in turn impacted people’s tactical decisions. The Corsica rarely sees currents strong enough to significantly influence sailing. We had great attendance with 14 sailors from six different clubs, 2 Laser Districts (10 and 11), and four states. Mike Schmidt of MRSA and Jacques Kerrest of PRSA both sailed fast and alternated first and second in both races with Mike winning the tie-breaker to take the regatta. Full results along with some great pictures (taken by a veritable paparazzi of photographers) will be posted soon on www.CRYC.org. After the sailing everyone headed in for plenty of food and drinks and enjoyed a lovely Spring day. Thank you very much to all who attended and supported our regatta. The inaugural Spring Regatta exceeded my expectations thanks to your support and hopefully we can make this an annual event (so please put it on your calendar). Thanks to the CRYC membership for putting on a great show with plenty of support people and boats and much appreciated food and drink, including cupcakes particularly appreciated by Jane Schmidt and Rich Parolski, amongst others. Hopefully see you all at the CRYC Annual Regatta July 28th-29th, when we expect to be sailing out in the open water of the Chester River. The day started out cloudy but by the last race the sun was out. The wind was from the north as predicted but the velocity was more than predicted. The was some hiking involved and surfing of waves downwind due to the current. Tim Zimmerman and Eric Petersen set up a triangle and ran all different races like last week. 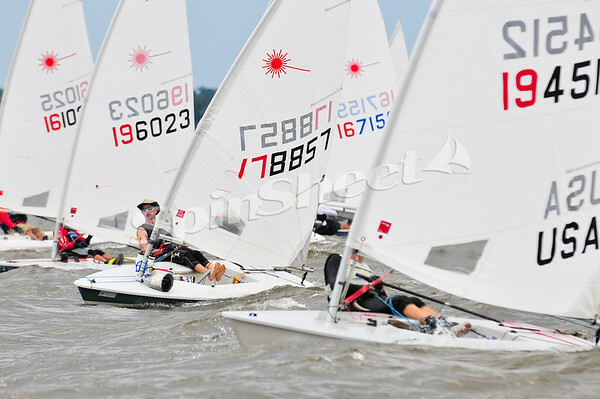 The course was set towards the Virginia side of the river with the jibe mark set inline with the end of the runway. Only thirteen boats came out to sail, our lowest turnout of the season. The little bro dominated the day throwing out a second place on the day. That makes me the first loser for the second straight week and Len was in third for a second straight week. See scores below. Thanks to Eric Petersen for blowing the whistles, I forgot the ollie at home. We sail again this Sunday. See you then. Eric Petersen has posted some photos here. PRO Tim Zimmerman has posted a playlist of start videos. 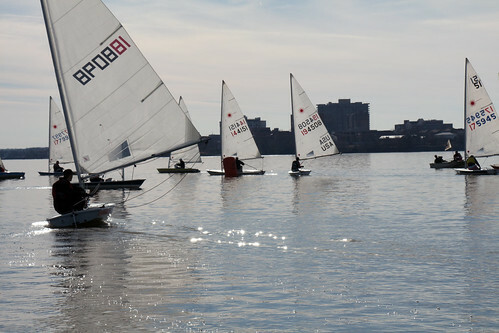 Last Saturday the PRSA Laser fleet was out sailing their spring regatta. Aaron Boesenecker has posted a gallery of photos which can be seen here.